Winter off-season is always a good chance to change my habits to improve my potential. I tried several new things in December and January for the coming season. First, I tried to change my diet to high-fat which many endurance athletes recently adopt to improve efficiency of energy consumption. I continued for two weeks, but it didn’t work for me! Meal became least fun and I couldn’t endure its monotony of taste. Second, I started core training. I’ll reach the age of 45 this year and it’s getting more difficult to keep core muscle. What Krissy Moehl was talking at Seven Hills Running Shop as an advice to aged runner triggered me to do it. Third, until last year I had been spending more time on road and treadmill during winter, but I started to run more time in the mountains using week-end. What Gary Robbins was talking about how you prepare HURT at the shop made me reaffirm that it’s important to mimic the target race while training. 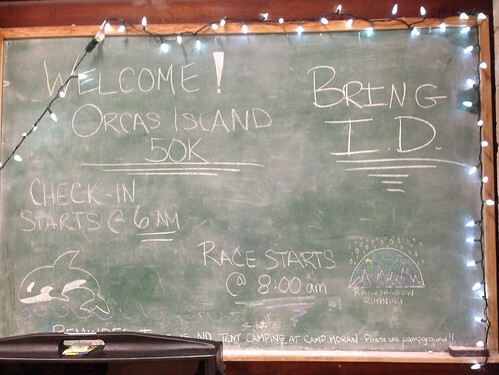 And I will know how 2nd and 3rd really worked well at Orcas. 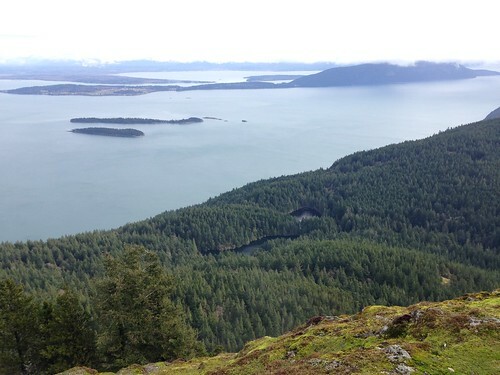 Needless to say that Orcas Island 50k is one of the most scenic race. 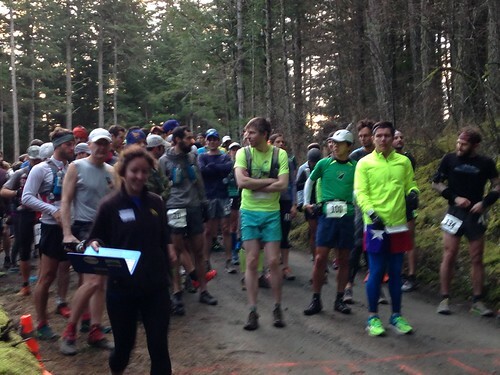 What makes it more special is PNW trail running community. 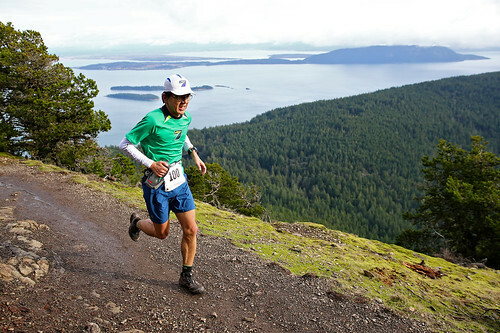 Team Rainshadow, volunteers, runners and anybody coming to join this race create great ambiance. 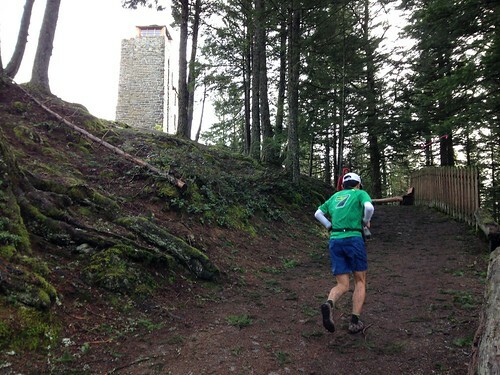 The course starts with 5-mile paved climb, followed by rather rolling-hills in the old-growth forest and alongside of lakes. Then the infamous Powerline climb awaits. After reaching to top of Mt. Constitution, left is easy 5-mile. As you see in my previous post, my primary objective of this race was to check my physical condition. 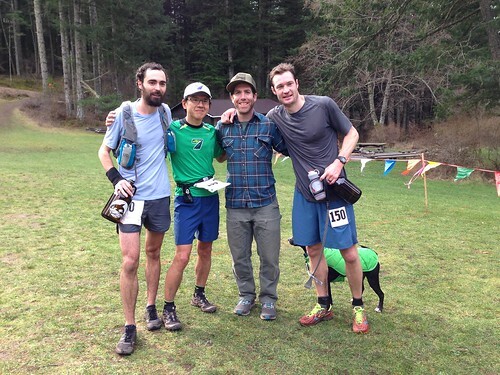 I knew Nate Jaqua and Maxwell Ferguson, always faster than me, were in the start list. So 1st place was not in the scope. 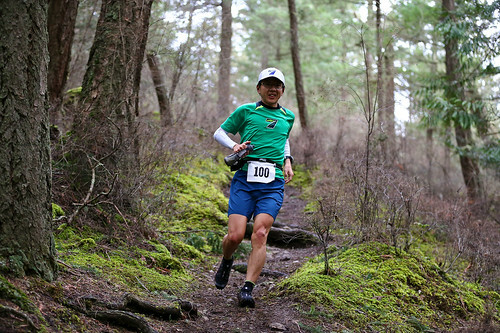 Unlike chilly and muddy last year, weather and trail were favorable. But it’s PNW February. I chose Salomon S-Lab Speed. They hold any terrain. 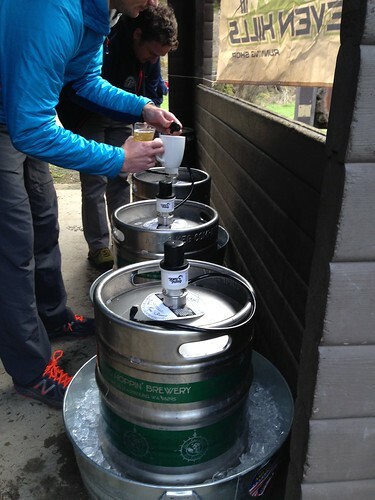 They are grippy and responsive. Right after starting the race, I was unexpectedly the leader. By 3-mile, two runners whom I was not very familiar with passed me by, but I didn’t try to follow them, let the go and kept my pace. It’s too early to start the race. 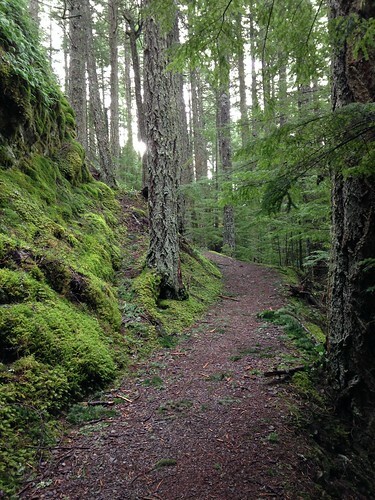 After the paved uphill was beautiful mossy old forest. 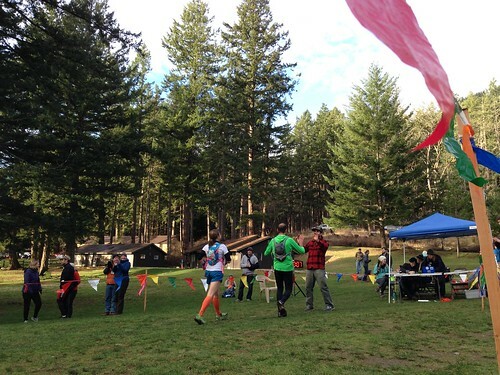 It was getting difficult to see the two leading runners in the woods, but I continued my race. I was always 3rd at this point. One of the leaders slowed down after a while and I passed him. A mountain biker told me there was 3 minute distance between me and the leader. Before arriving North Arch aid station which is right before Powerline trail, Dave (David Bresnahan) caught me from behind. 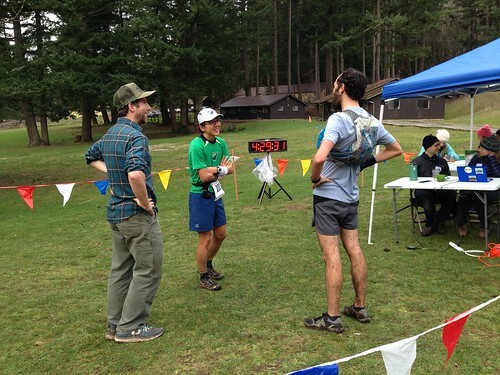 At the aid station, a volunteer told us there was only 1 minute distance to the leader. It wouldn’t take time for me and Dave to catch him. Then Powerline started. Voila, we found the leader in the middle of Powerline and easily passed. Now is the time to race with Dave. I was checking how Dave was responding to Power Line. It looked to me like I had more energy than him now. A runnable downhill began after Powerline, where I changed my gear to full-throttle. I did my very best to make a gap, and got a successful outcome. I didn’t see Dave following me any more. But who knows somebody chasing me. I kept pushing. I was also careful not to get lost. I got a twitch at the final stretch but kept going, and jumping-finished! High-five with James! 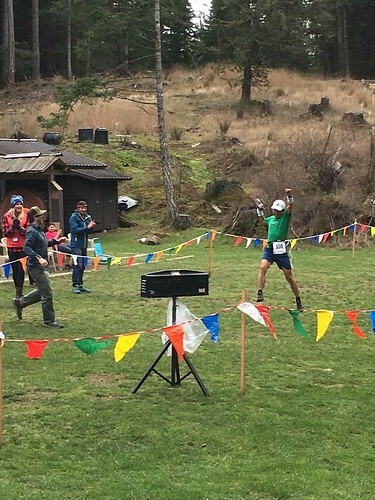 4:22:00 is mere 19 second behind the course record. I was always focusing on my race, so I may not have fully enjoyed the scenery as much as other runners, but I really enjoyed the race. I’m really happy to finish 1st in such a iconic race. The fun continues after the race. Enjoyed chatting, beers from Island Hoppin’ Brewery and pizza. 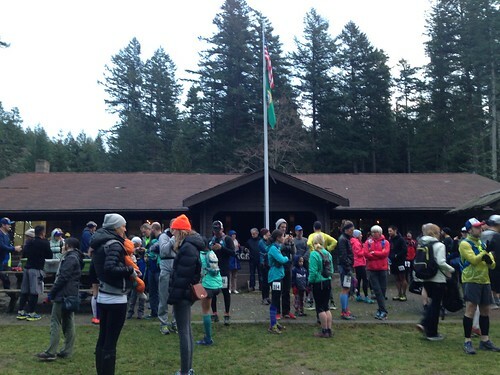 Thank you James Varner and Rainshadow Running for always organizing great event, all the volunteers for all your wonderful job, everybody there who create the ambiance, Glenn for shooting me greatly, Phil and Seven Hills Running Shop for your support, and Yoshi for anything! Yay, #Team7Hills!